Most of us picture burglars in all black, wearing a ski mask, and striking in the dead of night—at least, that’s what movies and TV shows teach us. However, that couldn’t be further from the truth! According to statistics from the FBI crime reports, more than 65 percent of home burglaries occur between 6 A.M. and 6 P.M. That’s right, more than half of all home break-ins in the U.S. happen when you’re off at work and the kids are at school. Largely, burglaries occur in this span of time specifically because no one is home to stop them. So, when you aren’t home, how do you protect all your belongings? 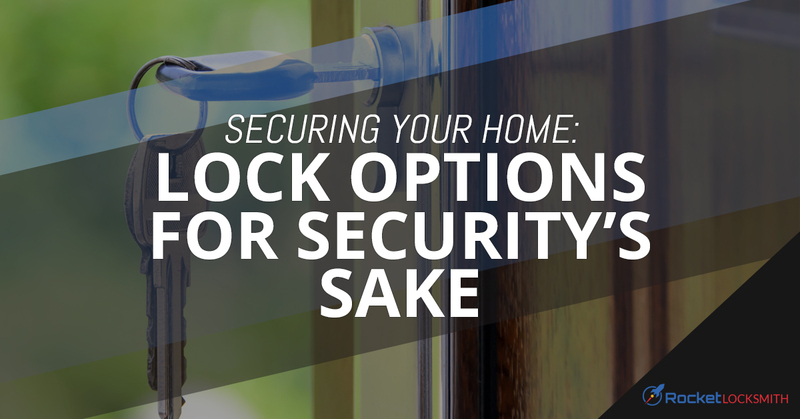 At Rocket Locksmith, we want to help you keep your home safe, so here’s what you need to know about choosing locks to protect your home. When selecting a target, burglars paid attention to potential security issues in the area, including quantity of foot traffic, police presence, possible escape routes, and how many homes in the area had home security systems or cameras. If the burglar could see evidence of a security system, more than half said they would find a different target. Most burglars polled said they more often forced windows and doors rather than taking the time to pick locks. So, what does this mean for you? Essentially, a few preventative measures can go a long way toward making your home less of a likely target for burglars. Let’s start with the basics, your door locks. Unless you live in a high-end neighborhood or a very tech-savvy area, odds are good your home comes standard with the twist lock on the doorknob and a turn-key deadbolt on all exterior facing doors—except, perhaps, the door that leads into the garage. This is the case for most homes across the country, and is the standard for a reason. The standard locks are the standard because they represent the point at which security and cost-effectiveness meet. Which is to say that they work well enough, but they also don’t cost a ton. The important thing to note about the standard deadbolt is, unless it’s installed properly, it doesn’t actually do much to stop a forced entry. That metal plate that gets screwed into the door frame does more than protect the wood of the frame; it actually helps make it harder to force the door open. However! Unless that metal plate is screwed in with screws at least three inches long, the deadbolt and metal plate won’t hold sturdily enough to do much good. Unfortunately, many contractors disregard the screw length necessary when installing the locks so, if you plan to stick with the standard locks, be sure your metal plates have long enough screws! If you aren’t ready to make the full upgrade to a home security system with cameras, there are a few other things you can do to up the safety of your locks. The first is to invest in 7-pin tumblers. The standard locks use 5-pin tumblers and can usually be picked in a matter of minutes. The additional two pins make a standard-looking lock much harder to pick or bump, and can often be installed during a standard re-keying process. In addition to more complex locks, there are several commercial-grade lock options made with more durable materials, which are harder to force or drill. The other option is to ditch your keys entirely. A keyless entry system is designed to replace your deadbolt, and often the doorknob. With a keyless deadbolt, you program in a code (or codes), and ditch your keys entirely! Even better, most modern systems connect to your home’s wi-fi and notify you via text message or email any time someone enters a code, so you know almost down to the second if someone accesses your home. If you’re looking for more ways to improve your St. Louis home’s security, contact the experienced and knowledgeable team at Rocket Locksmith today!